From Rory's Story Cubes. Imagine reading your favourite Batman comic that ends on a cliff-hanger, or wanting to add your own twist to a Batman story. StoryWorlds Batman now gives you the power to create and extend your own batman stories, leap off the comic strip or even create that new game boss from your console game. 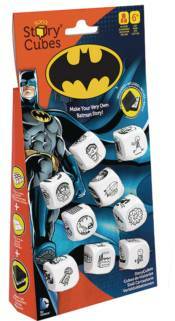 Roll the nine dice, look at the images and delve deeper into the batman universe crafting your own batman adventures. Will the Joker finally defeat Batman? You decide their fates. This is for the ultimate Batman fan, show off your Batman knowledge by creating the craziest storylines imaginable.